My dog is allergic to chicken. When he eats chicken dog food he gets diarrhea. I've read your page on types of dog allergies and now I suspect he has other allergies as well. My vet says he can give my dog medications to stop his itching and heal his sore spots, but I'm afraid to do that because my friend's dog died from getting a drug for allergies. I can't remember the name of the drug. Seriously, I don't know what to do about this? I want to help my dog have a nice life. I think he's miserable with all the scratching and it's driving my husband nuts. Comments for My dog is allergic to chicken. Will he ever be able to eat chicken again? Yes, your dog will be able to eat chicken again. Chicken is a common allergy problem for dogs. You can get your dog eating chicken again but it will take time to repair what has gone wrong in his gut. So, for the time being, while you work on it, don't feed chicken. 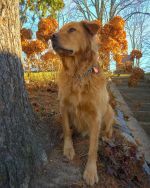 The article on this page explains what has to happen in order for your dog to have a fully functioning Immune system that will protect him from allergens and pathogens of all sorts. In short, that includes...feeding a raw diet, or at least a diet that includes some fresh meat food. Beef liver, kidneys or beef heart would be good here since your dog is allergic to chicken. Do your best to eliminate all other possible sources of allergy ingredients, the most common of which are corn, wheat, soy and gluten from grains that is added to dog food as a source of protein. Check your bag. Also, consider holding off on vaccinations in order to give your dog's immune system a chance to recover and work on it's own. If you're concerned about protection, antibody titre testing is an excellent option. You'll very likely have to incorporate some herbs and supplements to help your dog gently detox, support his liver function and balance/boost his gut bacteria to support better immune function. This will all take time, so don't be looking for fast results. Just want you to hear that clearly. If you need more help with supplement suggestions let me know here.